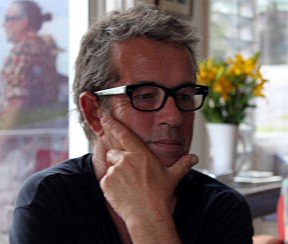 Michael Keighery’s mixed media, ceramic-based and performance art, is collected, respected and exhibited worldwide. From the Second Beijing International in China to the Huntington Gallery in Boston USA, his work has been featured in major contemporary art events. In Australia he has presented regular solo exhibitions in Sydney, as well as at the Brisbane City Gallery, New England Regional Art Museum, and Maitland Regional Art Gallery. Keighery has recently been commissioned to complete a number of public art projects such as the ‘Sirens of Woolungah’ for Wollongong Council, mural commissions for the University of Western Sydney, Green Bans Park for South Sydney Council and for Liverpool Council’s Library. He is also an acclaimed pyrotechnic and performance artist. Keighery’s work incorporates cutting edge digital technology to merge text and imagery with ceramics and other media. An acerbic social commentator, his work is frequently controversial constantly treading the border between the acceptable and the unacceptable. This artist’s work is widely collected and represented in prestigious public collections including the National Gallery of Australia, National Gallery of Victoria, Art Gallery of WA, Powerhouse Museum, Artbank, Taipei FineArts Museum and the Fuping International Ceramics Galleries, China as well as many regional galleries across Australia. Keighery has had a distinguished career as an arts educator and policy maker most recently as Head of Fine Arts Program UWS from 2003 to 2007, National President (Australia) International Association of Art (IAA), Chair of National Association of the Visual Arts (NAVA) as well as Chair of Viscopy and a member of the NSW Arts Advisory Council, NSW Ministry for the Arts. Keighery also has a long history of exploring how new technologies such as CNC Milling and 3D Printing can be incorporated into traditional ceramic studio production processes.